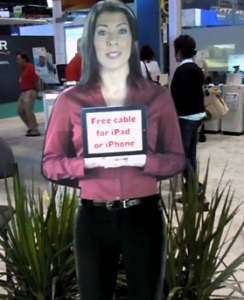 Virtual Mannequins have been popping up in discussion quite a bit around the Digital Signage world recently. As with most new technologies, there are plenty of people for and against it; especially in its earliest stages. With this, MyMedia wants to provide its view on how Virtual Mannequins will affect the sales environment. The advent of Virtual Mannequins seems to have brought on a case of “marketing myopia” as digital marketers are unsure what to make of these lifelike displays. Some marketers believe Virtual Mannequins are strictly a way to increase operational efficiency while decreasing wages. Others believe this is an insult to their sales staff. MyMedia has chosen to take a different view after spending their time looking for ways to improve Toronto’s retail landscape and hopes the rest of Canada will agree. Virtual Mannequins are not intended to replace your highly skilled sales staff, nor are they designed to close a sale. Virtual Mannequins are however an excellent way to increase traffic into your store initiating the dialogue with visitors and engaging them for your sales staff an opportunity to do what they do best; sell. Few question how striking a Virtual Mannequin is in a store front of a high traffic area. Where Virtual mannequins do excel is drawing attention, engaging shoppers, and increasing foot traffic inside your retail space. Given the crowded advertising space, Virtual Mannequins are a great way to stand out and differentiate from the competition. Whether your Virtual Mannequin offers incentives to enter the store, answers frequently asked questions, or simply interests a larger number of people- Virtual Mannequins are certainly one of the most striking new technologies to draw people into your store. MyMedia is in consensus. We all see the potential that Virtual Mannequins have and the success that will follow the increased traffic in the space where your sales staff is. Let the Virtual Mannequin increase foot traffic and let your all star sales reps do the rest. As of June 2012, MyMedia has committed building a line a Virtual Mannequin/Presenters and will be available in the Toronto market by late July 2012.